At the age of five years, Maharajah Duleep Singh found himself on the golden throne of the Punjab, the 'land of five rivers', one of the most powerful independent Kingdoms in the Asian sub-continent and a thorn in the advancement of the British Empire. A country built by his father, the legendary one-eyed Lion-of-the-Punjab, Ranjit Singh, who was a contemporary of Napoleon, and who ruled the region by the power of his sword and with the fear of his name. The infant Maharajah Duleep Singh had much to live up to, although he found the enemies of his reign were not just from over the British-Sutlej border. After the Anglo-Sikhs Wars, Maharajah Duleep Singh, still a minor, was separated from his mother, surrendered the famed Koh-i-noor diamond and was removed from power by the underhand-means of the East India Company. Effectively exiled to Britain, he became an instant favourite of Queen Victoria and an exotic party accessory. He passed his time with the creme de la creme of Victorian high society; shooting game with the Prince of Wales in his very own Indian Palace in Suffolk's Elveden Hall and leading a most extravagant and lavish lifestyle. But after trying his hand at writing a West End play, standing for parliament, playing the field, and remonstrating with the British Government for the shortfall of his stipend, the deposed sovereign became disillusioned by his surroundings and sought to make a stand against the tyrannical establishment! The story of Maharajah Duleep Singh and his heirs is told with astounding and dazzling imagery, with unseen photographs of his family and friends, along with an array of rich Sikh art from the period, with famous canvases commissioned by the Maharajah which have become masterpieces in their own right. His family, the 'Heirs to the Lost Kingdom' who became the godchildren of Queen Victoria, played their own part in the story of Britain's first Sikh and Indian royal family, from being suffragette companions of Christabel Pankhurst, assisting Jews escape Nazi Germany, benefactors to East Anglia, founding a Norfolk Museum, patrons of numerous English establishments, marrying a Earl's daughter, to holding a mysterious dormant Swiss bank account. 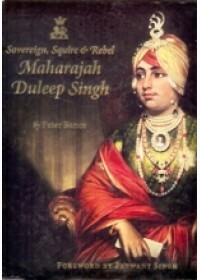 The story of the Duleep Singh's will surely keep every reader captivated. In the morally impaired years in Punjab after Maharajah Ranjit Singh's death in 1839, his youngest son, Duleep Singh's life depicts yet another irony of human existence. The deceitful conduct of the demagogues around him, combined with the no less duplicitous acts of the British across the Sutlej, who were scheming to take over the subcontinent's last great stronghold, would end up making Duleep Singh the 'son' that set on a failing empire. The son was ten months old when his father died but his mother Maharani Jind Kaur, well-endowed in equal measure with intelligence and good looks, kept him out of harm's way in those perilous times when many other aspirants to the throne would have gladly put an end to his life. By skillfully handling her little son's destiny despite the odds, she ensured he was crowned on 18 September 1843 and became the Maharajah of Punjab and its vast territories at the age of six. This is where life's ironies converged to make Duleep Singh's sojourn on earth an infinitely tragic experience. Although born into the magnificent surroundings of his father's palace in Lahore, yet, 55 years later, when the "son and heir to Ranjit Singh died, there was no one with him to close his eyes". (The Tribune, 25 October, 1893). His father had died when he was not even a year old as invariably happens when strong rulers die, Ranjit Singh's death too left the field open to adventures adept at all forms of treasonous acts. In the absence of a strong successor, Ranjit Singh's great legacy was squandered away by measly men and their shoddy ways. What happened during the ten intervening years between Ranjit Singh's death and the end of his empire? How did things get to the point that his son could be abducted from the land of his forefathers and end up dying alone in a hotel room in Paris? Why did his father's courageous and confident officer corps, crack military units, and all those who had played heroic roles under Ranjit Singh's inspired leadership, allow him to be removed from the land of his birth? Because the British were by far the wilier. When the time was right to first subvert, and then annex Ranjit Singh's empire with whom they had signed treaties of friendship, the British had no qualms about being the usurpers. They had been camped across the River Sutlej close to fifty years biding their time to annex Punjab. And now the time had come to lay their hands on India's last great stronghold. Many a base act was indulged in before the British succeeded in achieving their ends. First Duleep Singh was forcibly separated from his mother in 1847 at the age of eight, then banished from Punjab in 1850 to prevent resentful Sikhs from rallying around him. He was then quietly converted to Christianity in 1853 at the age of fifteen. The Governor General Lord Dalhousie's letter to Duleep Singh congratulating him on his conversion, is a classic. : "I earnestly hope that your future life may be in conformity by the precepts of that religion, and that you may show to your countrymen in India an example of a pure and blameless life, such as befitting a Christian prince." More to the point was Dalhousie's letter to a friend about Duleep Singh's conversion. "Politically, we would desire nothing better, for it destroys his influence forever." Which the British finally did. He was sent to Britain on 19 April 1854 and that was the last time he saw the land of his birth. Since the number of such double-dealings were many and each of breathtaking range, just one more would give an idea of the levels to which the British stooped to win against the Sikhs, after Ranjit Singh's death. In one breathtakingly perfidious act the British and Gulab Singh - the Kashmiri Brahmin whom Ranjit Singh had taken in his employ - proved that if personal interest required it treaties, oaths, pledges, promises or reassurances mattered very little. What mattered was - as we shall see - self interest. Even three years before Punjab was finally annexed in 1849, the British, by the Treaty of Lahore, took over many of the Sikh Empire's rich possessions including Jammu and Kashmir. These two they now sold to the treasonous Gulab Singh for 7,500,000 rupees or one million pounds. Thus was treason rewarded by the grateful British. But it would be interesting to take a brief look at the extent of Gulab Singh's treachery. "Unequivocal evidence exixts, which includes the army chief Sir Hugh Gough's dispatches, showing how Gulab Singh was persuaded by the British to betray the Sikh government - of which he was the Prime Minister in return of many British favours like the sale of Kashmir to him. And investing him with the title of Maharaja." (Empire of the Sikhs). The British fared even better themselves as Hardinge explained to Ellenborough while submitting the accounts of the Sutlej campaign, it cost two million pounds, of which a million was earned by selling Kashmir to Gulab Singh and another half a million came in the form of indemnity from the Lahore Durbar. So half a million was the total cost of the war to the East India Co. "From a financial point of view, the First Sikh War was one of the cheapest." The purpose of this fine book by Peter Bence will be best served if the reader remains focused on the reality of what happened during the ten years after Ranjit Singh's death, and till the time Duleep Singh died in a faraway land. British historians excel at verbal nobility in describing their own past glories, and explaining why they went to war and the exemplary manner in which they conducted it. But reality can be quite different. As George Bernard Shaw very aptly put it "...you will never find an Englishman in the wrong. He does everything on principles. He fights you on patriotic principles; he robs you on business principles; he enslaves you on imperial principles..."
So it is very good news indeed when Sikh historians like Peter Bance write prolifically to break the mould of make-believe history. Maharajah Duleep Singh may have died over a hundred years ago, but his legacy lives on. His name is always the first to be mentioned whether its past tales of the Btirish Raj, the early Sikh migration, glorious shooting records or antiquities in the London salerooms. Then there are squabbles over the rightful place of the illustrious golden throne of Ranjit Singh; the ownership of the infamous Koh-i-noor diamond, that symbol of power, authority and wealth, once owned by the Maharajah, but which now sits resplendently on the late Queen Mother's state crown; and the stories surrounding the mysterious end to the Maharajah's lineal descendants, as none of his eight heirs had children of their own. Was this a curse of the Koh-i-noor; the tenth Sikh Guru's prophecy; or Queen Victoria's part in making the royal family of Lahore extinct for the security of her empire? The truth is Maharajah Duleep Singh is still never far away from a headline, just as when he was alive. His life can be summed up as 'tragic', but his name alone still raises a brow, provokes discussion, reveals scandal, and embroils heartache even a century after his death. From an early age I can remember being told about the past glories of the Sikh Kingdom, the legendary Maharajah Ranjit Singh, the sparkling Kooh-i-noor diamond, and the deposed infant child king, Duleep Singh. To me these were mere stories, myths, or tales. Sometimes in life one needs to witness history for one-self, to touch it, feel it or see some physical evidence to believe that certain events actually occurred. For me it was during one quiet Sunday afternoon some twelve years ago, while driving through East Anglia with a friend that we decided to pass through Elveden, and see for ourselves the home of the one they called locally the 'Black Prince'. We arrived at the magnificent medieval stone church of Elveden, semi-veiled behind giant trees. Entering the gates of the churchyard, we stood silently at the graves of the Maharajah, his wife Bamba and son. A local resident informed us of a little museum in the nearby town of Thetford. A few moments later we were standing bewildered in a Tudor merchant's house, what could be described in a sense a memorial to the Duleep singh family, and it was then that my interest in Duleep Singh blossomed. I discovered that I knew very little of the Maharajah, let alone his children, one of whom, who had given Thetford this very museum. I came home proud of what I had discovered, like an archaeologist and his new find, but at the same time disappointed with myself at not knowing about such an important part of my Punjabi heritage, one which was local to me and not thousands of miles away in the northern regions of India. It was then that my journey began; there was much to read from, by contemporary and modern writers. But there was something tragically missing. The existence of the Maharajah's family had been overlooked. It was as if they had been erased from history. Their only accounts were to be found in dusty family photograph albums and the memories of the elderly village folk, be it friends, acquaintances or servants in the late service of the family. Memories, which if not recorded or saved, would be lost forever. My expedition continued, scanning the villages of Norfolk and Suffolk, and along with the precious personal reminiscences, I unearthed hidden gems that foretold the story in even greater splendour. Together with fresh research on the Maharajah's second family, his life in India, his heirs and his legacy, Sovereign, Squire & Rebel, is my tribute to a dynasty which was Punjab's own royal family. Introduction To ‘The Kohinoor Diamond’ By Iradj Amini One fabulous diamond whose value could ..
Introduction To The Book 'The Tragic Tale Of Maharaja Duleep Singh' By S. P. Gulati By late..
Introduction To 'Fighter For Freedom Maharaja Duleep Singh' By Dr. Baldev Singh Baddan Histor.. Preface Of The Book 'The Historical Study Of Maharaja Ranjit Singh's Times' By Dr. Kirpal Singh ..
From The Front Cover Of 'The Fall Of The Kingdom Of Punjab' By Khushwant Singh This riveting ..